Greenfield Ecostay is facing to the green rice paddy, garden, & many thing from the local rural. The room is designed with bamboo, wood material...very Eco & simple. On the other hand, you have time to play, take photo or just relax at among countryside feeling. Make sure, the tourist have great time for all. 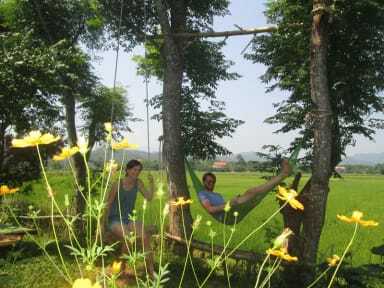 Greenfield Ecostay offers pet-friendly accommodations in Phong Nha. Guests can enjoy the on-site bar. Free private parking is available on site. Certain accommodations feature a sitting area for your convenience. A terrace or balcony are featured in certain rooms. For your comfort, you will find slippers and free toiletries.